Stephen F. Cohen, professor emeritus of Russian studies and politics at Princeton and NYU, and John Batchelor continue their (usually) weekly discussions of the new US-Russian Cold War. 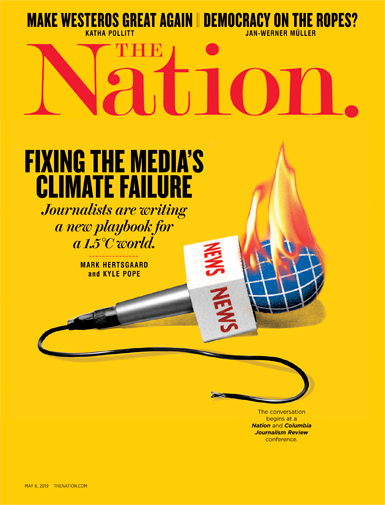 (Previous installments, now in their fifth year, are at TheNation.com.) This post is different. The conversation was based on Cohen’s article below, completed the day of the broadcast. Mainstream media outlets have played a major prosecutorial role in the demonization. Far from atypically, The Washington Post’s editorial-page editor wrote, “Putin likes to make the bodies bounce…. The rule-by-fear is Soviet, but this time there is no ideology—only a noxious mixture of personal aggrandizement, xenophobia, homophobia and primitive anti-Americanism.” Esteemed publications and writers now routinely degrade themselves by competing to denigrate “the flabbily muscled form” of the “small gray ghoul named Vladimir Putin.” There are hundreds of such examples, if not more, over many years. Vilifying Russia’s leader has become a canon in the orthodox US narrative of the new Cold War. But the Putin-friendly narrative soon gave away to unrelenting Putin-bashing. In 2004, Times columnist Nicholas Kristof inadvertently explained why, at least partially. Kristof complained bitterly of having been “suckered by Mr. Putin. He is not a sober version of Boris Yeltsin.” By 2006, a Wall Street Journal editor, expressing the establishment’s revised opinion, declared it “time we start thinking of Vladimir Putin’s Russia as an enemy of the United States.” The rest, as they say, is history. In America and elsewhere in the West, however, only purported “minuses” reckon in the extreme vilifying, or anti-cult, of Putin. Many are substantially uninformed, based on highly selective or unverified sources, and motivated by political grievances, including those of several Yeltsin-era oligarchs and their agents in the West. § Putin is not the man who, after coming to power in 2000, “de-democratized” a Russian democracy established by President Boris Yeltsin in the 1990s and restored a system akin to Soviet “totalitarianism.” Democratization began and developed in Soviet Russia under the last Soviet leader, Mikhail Gorbachev, in the years from 1987 to 1991. Yeltsin repeatedly dealt that historic Russian experiment grievous, possibly fatal, blows. Among his other acts, by using tanks, in October 1993, to destroy Russia’s freely elected parliament and with it the entire constitutional order that had made Yeltsin president. By waging two bloody wars against the tiny breakaway province of Chechnya. By enabling a small group of Kremlin-connected oligarchs to plunder Russia’s richest assets and abet the plunging of some two-thirds of its people into poverty and misery, including the once- large and professionalized Soviet middle classes. By rigging his own reelection in 1996. And by enacting a “super-presidential” constitution, at the expense of the legislature and judiciary but to his successor’s benefit. Putin may have furthered this de-democratization of the Yeltsin 1990s, but he did not initiate it. § Nor did Putin then make himself a tsar or Soviet-like “autocrat,” which means a despot with absolute power to turn his will into policy. The last Kremlin leader with that kind of power was Stalin, who died in 1953, and with him his 20-year mass terror. Due to the increasing bureaucratic routinization of the political-administrative system, each successive Soviet leader had less personal power than his predecessor. Putin may have more, but if he really was a “cold-blooded, ruthless” autocrat—“the worst dictator on the planet”—tens of thousands of protesters would not have repeatedly appeared in Moscow streets, sometimes officially sanctioned. Or their protests (and selective arrests) been shown on state television. Putin clearly understands that millions of Russians have and often express pro-Stalin sentiments. Nonetheless, his role in these still-ongoing controversies over the despot’s historical reputation has been, in one unprecedented way, that of an anti-Stalinist leader. Briefly illustrated, if Putin reveres the memory of Stalin, why did his personal support finally make possible two memorials (the excellent State Museum of the History of the Gulag and the highly evocative “Wall of Grief”) to the tyrant’s millions of victims, both in central Moscow? The latter memorial monument was first proposed by then–Kremlin leader Nikita Khrushchev, in 1961. It was not built under any of his successors—until Putin, in 2017. § Nor did Putin create post–Soviet Russia’s “kleptocratic economic system,” with its oligarchic and other widespread corruption. This too took shape under Yeltsin during the Kremlin’s shock-therapy “privatization” schemes of the 1990s, when the “swindlers and thieves” still denounced by today’s opposition actually emerged. Putin has adopted a number of “anti-corruption” policies over the years. How successful they have been is the subject of legitimate debate. As are how much power he has had to rein in fully both Yeltsin’s oligarchs and his own, and how sincere he has been. But branding Putin “a kleptocrat” also lacks context and is little more than barely informed demonizing. Few, if any, modern-day world leaders have been so slurred, or so regularly. Nor does Sasse actually “know” any of this. He and the others imbibe it from reams of influential media accounts that fully indict Putin while burying a nullifying “but” regarding actual evidence. Thus another Times columnist: “I realize that this evidence is only circumstantial and well short of proof. But it’s one of many suspicious patterns.” This, too, is a journalistic “pattern” when Putin is involved. Leaving aside other world leaders with minor or major previous careers in intelligence services, Putin’s years as a KGB intelligence officer in then–East Germany were clearly formative. Many years later, at age 65, he still speaks of them with pride. Whatever else that experience contributed, it made Putin a Europeanized Russian, a fluent German speaker, and a political leader with a remarkable, demonstrated capacity for retaining and coolly analyzing a very wide range of information. (Read or watch a few of his long interviews.) Not a bad leadership trait in very fraught times. Moreover, no serious biographer would treat only one period in a subject’s long public career as definitive, as Putin demonizers do. Why not instead the period after he left the KGB in 1991, when he served as deputy to the mayor of St. Petersburg, then considered one of the two or three most democratic leaders in Russia? Or the years immediately following in Moscow, where he saw firsthand the full extent of Yeltsin-era corruption? Or his subsequent years, while still relatively young, as president? As for being a “murderer” of journalists and other “enemies,” the list has grown to scores of Russians who died, at home or abroad, by foul or natural causes—all reflexively attributed to Putin. Our hallowed tradition is that the burden of proof is on the accusers. Putin’s accusers have produced none, only assumptions, innuendoes, and mistranslated statements by Putin about the fate of “traitors.” The two cases that firmly established this defamatory practice were those of the investigative journalist Anna Politkovskaya, who was shot to death in Moscow in 2006, and Alexander Litvinenko, a shadowy one-time KGB defector with ties to aggrieved Yeltsin-era oligarchs, who died of radiation poisoning in London, also in 2006. Not a shred of actual proof points to Putin in either case. The editor of Politkovskaya’s paper, the devoutly independent Novaya Gazeta, still believes her assassination was ordered by Chechen officials, whose human-rights abuses she was investigating. Regarding Litvinenko, despite frenzied media claims and a kangaroo-like “hearing” suggesting that Putin was “probably” responsible, there is still no conclusive proof even as to whether Litvinenko’s poisoning was intentional or accidental. The same paucity of evidence applies to many subsequent cases, notably the shooting of the opposition politician Boris Nemtsov, “in [distant] view of the Kremlin,” in 2015. § More recently, there is yet another allegation: Putin is a fascist and white supremacist. The accusation is made mostly, it seems, by people wishing to deflect attention from the role being played by neo-Nazis in US-backed Ukraine. Putin no doubt regards it as a blood slur, and even on the surface it is, to be exceedingly charitable, entirely uninformed. How else to explain Senator Ron Wyden’s solemn warnings, at a hearing on November 1, 2017, about “the current fascist leadership of Russia”? A young scholar recently dismantled a senior Yale professor’s nearly inexplicable propounding of this thesis. My own approach is compatible, though different. Whatever Putin’s failings, the “fascist” allegation is absurd. Nothing in his statements over nearly 20 years in power are akin to fascism, whose core belief is a cult of blood based on the asserted superiority of one ethnicity over all others. As head of a vast multiethnic state—embracing scores of diverse groups with a broad range of skin colors—such utterances or related acts by Putin would be inconceivable, if not political suicide. This is why he endlessly appeals for harmony in “our entire multi-ethnic nation” with its “multi-ethnic culture,” as he did once again in his re-inauguration speech in 2018. Russia has, of course, fascist-white supremacist thinkers and activists, though many have been imprisoned. But a mass fascist movement is scarcely feasible in a country where so many millions died in the war against Nazi Germany, a war that directly affected Putin and clearly left a formative mark on him. Though he was born after the war, his mother and father barely survived near-fatal wounds and disease, his older brother died in the long German siege of Leningrad, and several of his uncles perished. Only people who never endured such an experience, or are unable to imagine it, can conjure up a fascist Putin. There is another, easily understood, indicative fact. Not a trace of anti-Semitism is evident in Putin. Little noted here but widely reported both in Russia and in Israel, life for Russian Jews is better under Putin than it has ever been in that country’s long history. § Finally, at least for now, there is the ramifying demonization allegation that, as a foreign-policy leader, Putin has been exceedingly “aggressive” abroad. At best, this is an “in-the-eye-of-the-beholder” assertion, and half-blind. At worst, it justifies what even a German foreign minister characterized as the West’s “warmongering” against Russia. In the three cases widely given as examples of Putin’s “aggression,” the evidence, long cited by myself and many others, points to US-led instigations, primarily in the process of expanding the NATO military alliance since the late 1990s from Germany to Russia’s borders today. The proxy US-Russian war in Georgia in 2008 was initiated by the US-backed president of that country, who had been encouraged to aspire to NATO membership. The 2014 crisis and subsequent proxy war in Ukraine resulted from the long-standing effort to bring that country, despite large regions’ shared civilization with Russia, into NATO. And Putin’s 2015 military intervention in Syria was done on a valid premise: either it would be Syrian President Assad in Damascus or the terrorist Islamic State—and on President Barack Obama’s refusal to join Russia in an anti-ISIS alliance. As a result of this history, Putin is often seen in Russia as a belatedly reactive leader abroad, not as a sufficiently “aggressive” one. Embedded in the “aggressive Putin” axiom are two others. One is that Putin is a neo-Soviet leader who seeks to restore the Soviet Union at the expense of Russia’s neighbors. He is obsessively misquoted as having said, in 2005, “The collapse of the Soviet Union was the greatest geopolitical catastrophe of the twentieth century,” apparently ranking it above two World Wars. What he actually said was “a major geopolitical catastrophe of the twentieth century,” as it was for most Russians. The other fallacious sub-axiom is that Putin has always been “anti-Western,” specifically “anti-American,” has “always viewed the United States” with “smoldering suspicions.” A simple reading of his years in power tells us otherwise. A Westernized Russian, Putin came to the presidency in 2000 in the still-prevailing tradition of Gorbachev and Yeltsin—in hope of a “strategic friendship and partnership” with the United States. Hence his abundant assistance, following 9/11, to the American war in Afghanistan. Hence, until he believed Russia would not be treated as an equal and NATO had encroached too close, his full partnership in the US-European clubs of major leaders. If my refutation of the axioms of Putin demonization is valid, where does that leave us? Certainly, not with an apologia for Putin, but with the question, “Who is Putin?” Russians like to say, “Let history judge,” but given the perils of the new Cold War, we cannot wait. We can at least begin with a few historical truths. In 2000, a young and little-experienced man became the leader of a vast state that had precipitously disintegrated, or “collapsed,” twice in the 20th century—in 1917 and again in 1991—with disastrous consequences for its people. And in both instances, it had lost its “sovereignty” and thus its security in fundamental ways. These have been recurring themes in Putin’s words and deeds. They are where to begin an understanding. No one can doubt that he is already the most consequential “statesman” of the 21st century, though the word is rarely, if ever, applied to him in the United States. And what does “consequential” mean? Even without the pseudo-minuses spelled out above, a balanced evaluation will include valid ones. For example, at home, was it necessary to so strengthen and expand the Kremlin’s “vertical” throughout the rest of the country in order to pull Russia back together? Should not the historic experiment with democracy have been given equal priority? Abroad, were there not alternatives to annexing Crimea, even given the perceived threats? And did Putin’s leadership really do nothing to reawaken fears in small East European countries victimized for centuries by Russia? These are only a few questions that might yield minuses alongside Putin’s deserved pluses. Whatever the approach, whoever undertakes a balanced evaluation should do so, to paraphrase Spinoza, not in order to demonize, not to mock, not to hate, but to understand.